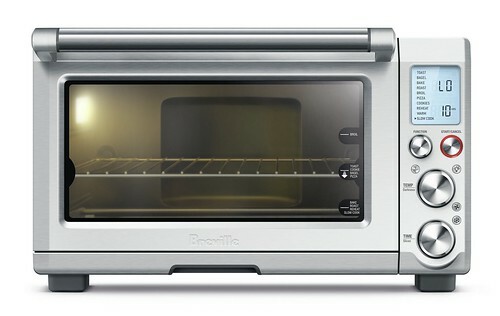 The Smart Oven® Pro, BOV845BSS – With Element IQ™, a new interior light, and an incredible Slow Cook Function, the BOV845BSS Smart Oven® Pro can make whatever you like, however like whenever you like. A. 12" by 12" Enamel Broiling Rack. B. 12" by 12" Enamel Baking Pan. C. 13" Non-Stick Pizza Pan. D. Door Handle. E. Oven Light. F. Top Rack Height Position: BROIL Function. G. Middle Rack Height Position: TOAST, BAGEL, PIZZA and COOKIES Functions. 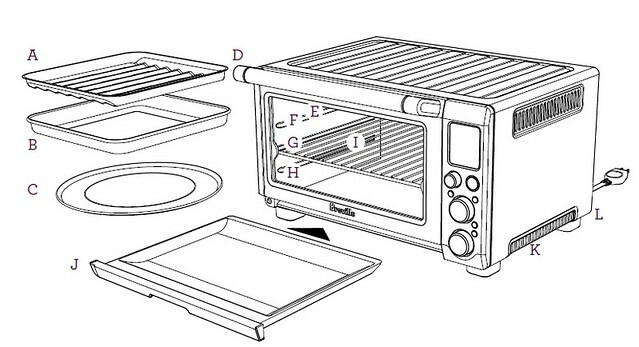 H. Bottom Rack Height Position: BAKE, ROAST, REHEAT, WARM, and SLOW COOK Function. I. Wire Rack. J. Crumb Tray. 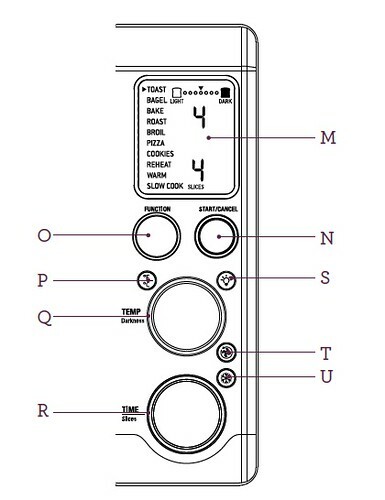 K. Ventilation Slots. L. Breville Assist® Plug. M. LCD Screen. N. START/CANCEL Button. O. FUNCTION Button. P.TEMPERATURE Conversion Button. Q. TEMPERATURE Dial/Toast and Bagel Darkness Control. R. TIME Dial/Toast and Bagel Slice Selection/ Pizza Size Selection. S. OVEN LIGHT Button. T. CONVECTION Button.